The sQuba, developed by Swiss company Rinspeed, is the world's first car that can be driven both on land and under water.. It can be submerged to a depth of 10 metres (33 ft), powered by twin electric-powered propellers supplemented by two Seabob water jets.r. 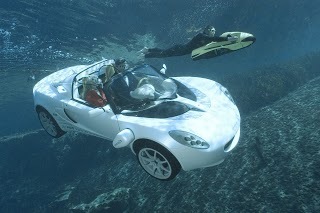 The car's top land speed is 120 km/h in water 3 km/h.